NEST 2019 - The National Entrance Screening Test, commonly known as NEST is an examination conducted jointly by National Institute of Science Education and Research (NISER) Bhubaneswar and University of Mumbai - Department of Atomic Energy Centre for Excellence in Basic Sciences (UM-DAE CEBS), Mumbai for admissions to integrated MSc programmes on offer in these institutes. NEST 2019 is scheduled to be held on June 1, 2019, in two sessions. NISER and UM-DAE CEBS published the NEST admission 2019 notification on January 2, 2019. NEST 2019 will be conducted in as many as 91 cities across India. The three and half hour duration paper of NEST exam 2019 will be administered in a computer-based mode in two different sessions. NEST 2019 will have objective-type questions with multiple-choice answer options. The NEST 2019 syllabus will be based on the syllabus of 10+2 standard. Candidates interested in pursuing the MSc-integrated programmes from the two institutes, NISER and UM-DAE CEBS need to check all about NEST. Careers360 brings you a detailed description of the NEST 2019 admissions including application process, exam pattern, syllabus, result and counselling of the National Entrance Screening Test. The admission process of NEST 2019 started with the release of the admission notification which was released on January 7, 2019. Interested candidates could fill and submit the application form by March 18, 2019 (midnight). The online admit card containing the examination schedule and exam centre details will be released on April 24, 2019. NEST 2019 will be conducted in the online mode in two sessions with a duration of three and a half hours. The NEST 2019 result will be released online on June 17, 2019 following which the conducting body will release the merit list containing the list of candidates who have qualified for the Counselling process. Candidates called for the counselling procedure need to submit all the necessary documents after which candidates can secure their admission for the course of their choice. Candidates must have qualified Class 12 examination in 2017 or 2018. Candidates who are appearing for Class 12 examination in 2018 are also eligible to apply for the test. Candidates belonging to the reserved category (SC/ST) must secure a minimum of 55 per cent marks aggregate in their qualifying examination. Age Limit: Candidates who wish to apply must be born on or after August 1999. There will be a relaxation of 5 years in age limit for SC/ST PWD candidates. The online application form for NEST 2019 was released on January 7, 2019. The registration and online process for NEST 2019 application form continued till March 18, 2019 (midnight). To register and apply candidates can follow the steps given below. The application fee has to be submitted in the online mode through the SBI payment gateway. NEST will be conducted in 91 examination cities in the country. Candidates can select upto five exam centre cities of their preference. Candidates will be allotted exam centres as per the preferences entered in the application form. Although it must be noted that there will be no provision to change the exam centre after it has been allotted by the university. 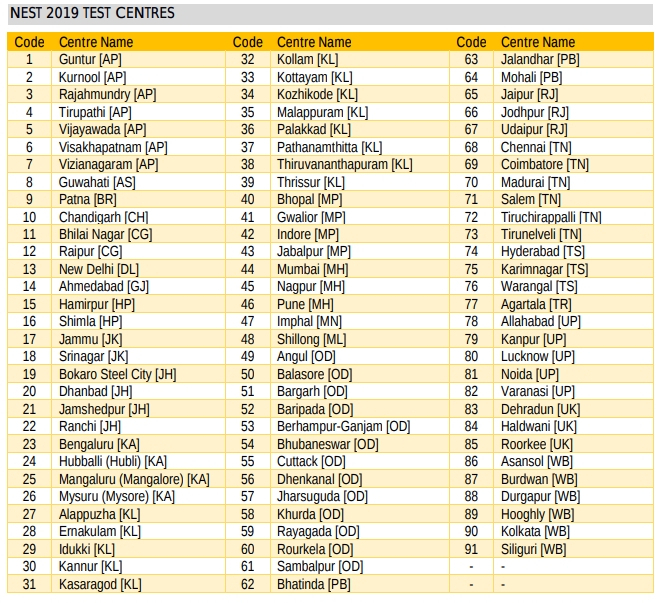 The list of exam cities is given below. NEST Exam 2019 will be conducted in the Computer Based Mode (Online) on June 1, 2019. Candidates need to answer the test in a duration of three and a half hours. The questions will be divided into five sections. Negative marking will be applicable for a few of the sections which will be mentioned. Candidates must also note that some questions will carry one or more correct answer. Candidates need to mark all the correct answer to secure the marks. All the questions will be Multiple Choice. The detailed NEST 2019 exam pattern is mentioned here. NEST result 2019 will be released online on June 17, 2019. The result will contain total number of candidates who appeared for the entrance test along with the marks secured. The merit list of NEST 2019 will be released soon after the NET result 2019 is released. The NEST merit list 2019 will be prepared soon after the results of NEST 2019 is released on June 17, 2019. The NEST 2019 merit list will contain the minimum marks secured by candidates who have qualified the entrance test. Candidates whose names feature in the merit list will be called for the admission counselling of NEST 2019. Candidates will be called for counselling based on the merit list released. The merit list will contain the list of candidates who have qualified for the counselling process along with their rank and marks scored. Candidates need to submit all the certificates and relevant document during the counselling process. Q: Will the applications for NEST 2019 be available offline? Ans: No, the applications will be available online only. Q: What all documents need to be uploaded in the application form? Ans: Candidates need to upload their Passport size photograph and signature images. Q: Can the exam centres be changed after the admit card is released? Ans: No, there will be no provision to change the exam centre after the release of the admit card. Q: Do the institutes provide a two-year master’s programme? Ans: NEST is conducted only for admissions to 5-year Integrated programmes. Q: In what mode is the entrance test conducted? Q: Will the Results be released offline? Ans: No, the results of NEST 2019 will be released in the online mode only.